A cohort of 20 students from the three participating universities in ESSA project (the University of Edinburgh, the University of Porto and Kaunas University of Technology) has been trained as Social Responsibility Auditors in a student-centred, action-reflection learning based programme. 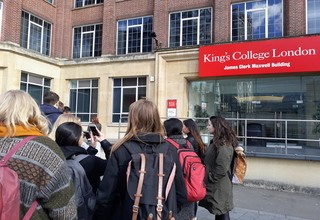 From the 11th to the 15th March, they are delivering an audit of the King’s College London on Social Responsibility, complete with an audit report that provides the university with recommendations for improvements in the sphere of university social responsibility (USR). During the audit, they will examine King’s policies and procedures, interview senior staff, and conduct a focus group with King’s students. Eight students from King’s College London have also been trained as Social Responsibility Audit Assistants and will support the visiting students throughout the audit of King’s. Visiting students will be awarded a Certificate in Social Responsibility Auditing (EQF Level 6, 5 ECTS credits) following satisfactory completion of the training, the linked audit and the assessment of an individual e-portfolio of evidence of learning. The ESSA Project itself will provide an innovative Open Education Resource (OER), to be launched in summer 2019, that will provide universities across the European Higher Education Area to deliver the programme.